In order to confirm the reservation, we will require you a prepayment calculated as follows: 100% if the bill is less than 200 €, 30% if more (with a minimum of 200 €). This amount will be totally deduced from your bill of stay. On-line: Prepayment by credit card. Your reservation will be confirmed immediately. The system will automatically send the confirmation to your email address. Subjet: -- your name, client number and reservation number -- Please specify the name you used when requesting the reservation. The deadline for receiving this prepayment is 5 days. In the positive case, we will send you the confirmation of the reservation. Please note that this payment does not automatically convert your reservation in definitive: the reservation is definitive when we send you our confirmation. When is the rest of the stay paid? The first day, at the reception, on arrival at the campsite. We don't reserve particular plots: the plot will be assigned on arrival. In case you tell us your preferences for some camping plots, we will make our best to fulfill them choosing among the plots that are free when you arrive. In case you wanted several places, one next to the other or near each other, we cannot assure you that this is going to be possible. If you want to change the assigned camping plot, before you have to ask for permission to the reception. Admission: Each single reservation entitles you to one plot. The reservation is personal and not transferable. 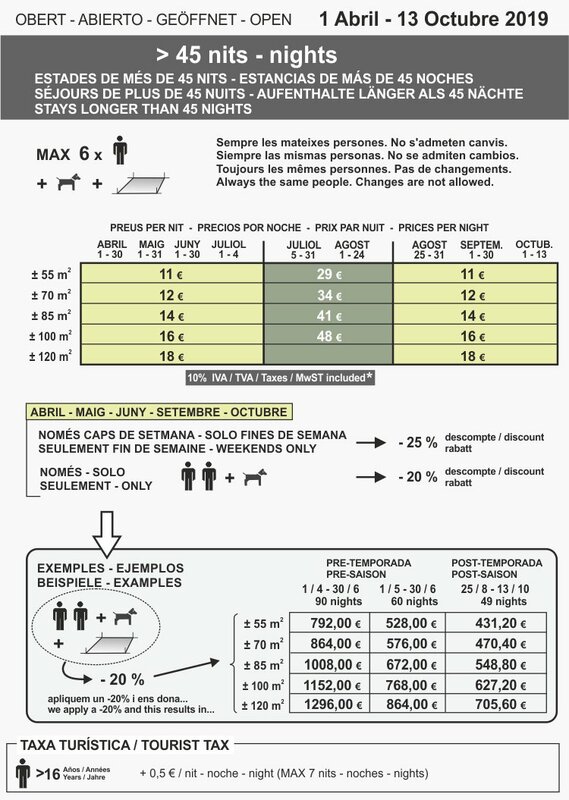 Maximum 6 persons per camping plot. In case of a group of young people, you have to tell us before reserving, since we have some areas of the campsite that are especially intended for young people. Stay and schedule: During high season we can only accept reservations for a minimum stay of 7 days. Arrival schedule: afternoon, from 12:00 to 21:00 of the assigned day. If you were to arrive later than 21:00, please warn us. Otherwise at 24:00 midnight of the arrival day your reservation will be automatically cancelled. Departure schedule: morning, from 7:00 to 12:00 of the assigned day. Payment: We will require you a prepayment calculated as follows: 100% if the bill is less than 200 €, 30% if more (with a minimum of 200 €). We will wait 5 days for this prepayment. The payment does not automatically convert your reservation in definitive: your reservation is only going to be definitive when we write it to you. At the arrival at the Campsite, the rest of the stay has to be paid. Cancellation: By cancellation of reservation, 50% of the payment will be lost. If it is cancelled during the latest 30 days up to the date of arrival, the whole amount will be lost. We will ask you 100 € as a damage deposit for each bungalow / apartment. This deposit has to be paid in cash, in order to facilitate its return when you leave. The campsite reserves the right to use this deposit in case of damages, lack of material, loss of the key or lack of cleaning. Equipment and admission: Rent-prices include: gas, electricity, parking for the car, persons and taxes. All our bungalows and apartments are equipped with kitchen, refrigerator and kitchen utensils. Bed linen and towels are included and are changed approximately every 7 days. Animals (for example, dogs or cats) are allowed in SOME accommodations; please, ask us. No more than the maximum number of guests permitted will be allowed. Complementary tents are not accepted. Smoking: Smoking is not permitted within the accommodation, but is allowed on the terrace or outside. 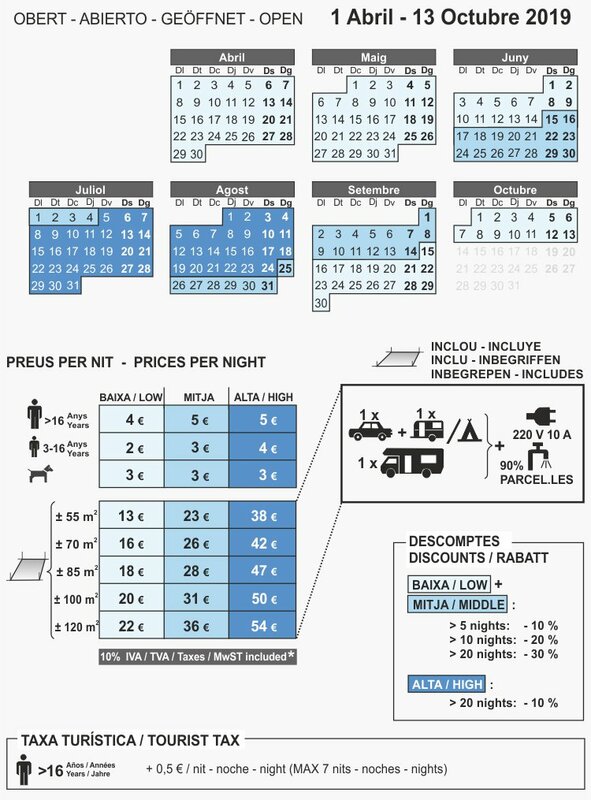 Stay and schedule: Minimum stay in medium and high season: 7 nights, from saturday to saturday or from sunday to sunday, depending on the accommodation type. Arrival schedule: afternoon, from 16:00 to 21:00 of the assigned day. If you were to arrive later than 21:00, please warn us. Otherwise at 24:00 midnight of the arrival day your reservation will be automatically cancelled. Departure schedule: morning, from 7:00 to 10:00 of the assigned day. Security deposit / Damage deposit: We will ask you 100 € as a damage deposit for each bungalow / apartment. This deposit has to be paid in cash, in order to facilitate its return when you leave. The campsite reserves the right to use this deposit in case of damages, lack of material, loss of the key or lack of cleaning. Cancellation: The customer pays for the days agreed upon in the booking-form, regardless whether he or she leaves earlier or not. By cancellation of reservation, 50% of the down payment will be lost. If it is cancelled during the latest 30 days up to the date of arrival, the whole down payment will be lost. What is still available for 2019? From 10 July to 15 August, minimum stay of 7 days. 70 m2 Pitch: Available until 24 July. Available from 30 July. 85 m2 Pitch: Available until 25 July. Available from 2 August. 100 m2 Pitch: Available until 21 July. Available from 10 August. 120 m2 Pitch: Available until 19 July. Available from 16 August. 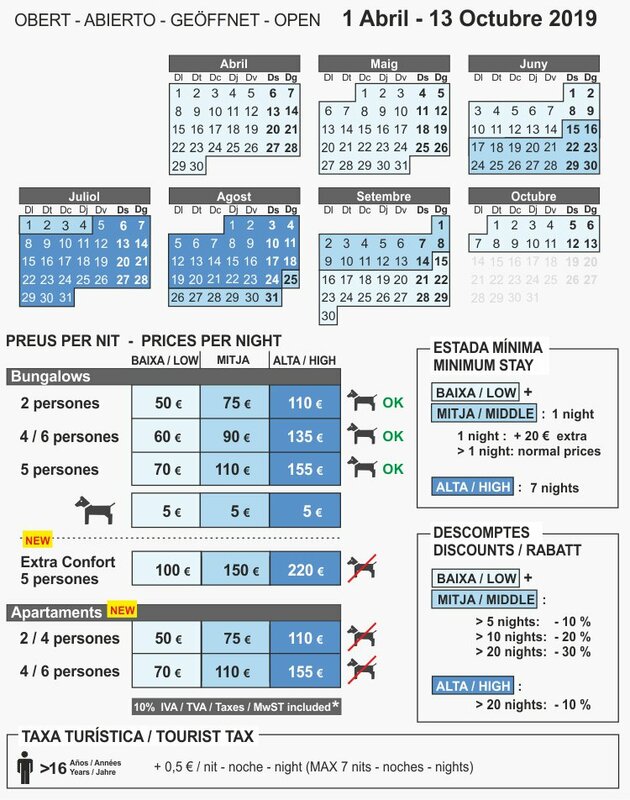 In July and August, the following accommodations are rented from SATURDAY to SATURDAY. Bungalow 2 pers: Available until 13 July. Available from 31 August. Bungalow 4/6 pers: Available until 20 July. Available from 24 August. In July and August, bungalows 5 pers are rented from SUNDAY to SUNDAY. Bungalow 5 pers: Available until 21 July. Available from 18 August. In July and August, bungalows 5 pers Extra Comfort are rented from SATURDAY to SATURDAY. Bungalow 5 pers Extra Comfort: Available. In July and August, apartments are rented from SATURDAY to SATURDAY. Apartment 2/4 pers: Available until 13 July. Available from 31 August. Apartment 4/6 pers: Available until 6 July. Available from 24 August.